Dates of birth and death unknown. 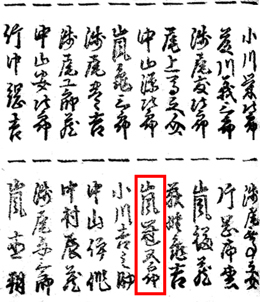 Most likely a disciple of Arashi Kanjûrô I. 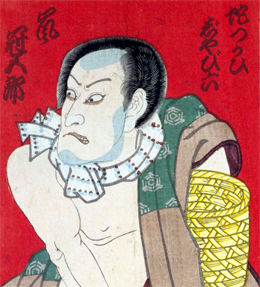 He was recorded in the 1819 Ôsaka hyôbanki and in the 1820 Kyôto hyôbanki in the koyaku/musumegata section. No record afterwards. Date of birth unknown. Disciple of Arashi Kanjûrô I, he was recorded as a koyaku actor performing at the Moritaza in the 11th lunar month of 1808. His first stage name was Arashi Mankichi II. He took the name of Arashi Kanzô in the 11th lunar month of 1816 at the Nakamuraza. His rank in the 1817 Edo hyôbanki, tachiyaku section, was jô (superior) [visual]. Arashi Kanzô and his master Arashi Kanjûrô I respectively took the names of Arashi Izaburô II and Arashi Kankurô III in the 11th lunar month of 1841 at the Kawarasakiza. Then, he took the name of Arashi Kangorô II in the 8th lunar month of 1842. His rank in the 1860 Edo hyôbanki, jitsuaku section, was jô-jô (superior - superior) [visual]. He was active up to the end of the Edo period. He died in 1868. There were records for an actor named Arashi Kangorô in 1872, in 1874, from 1878 to 1883 and in 1896. Same actor or different actors? The question is still open.